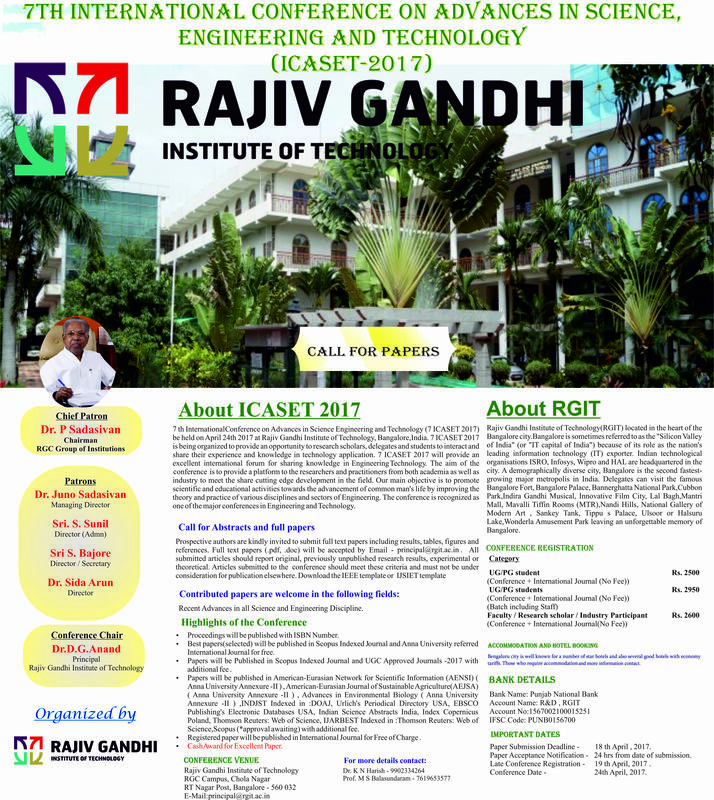 INTERNATIONAL CONFERENCE ON ADVANCES IN SCIENCE, ENGINEERING & TECHNOLOGY (ICASET-2017) be held on April 24th 2017 at Rajiv Gandhi Institute of Technology, Bangalore. ICASET-2017 is being organised to provide an opportunity to research scholars, delegates and students to interact and share their experience and knowledge in technology application. The aim of the Conference is to provide a platform to researchers and practitioners from both academia as well as industry to meet the share cutting edge development in the field. The conference is recognised as one of the major conferences in Engineering and Technology. Paper Presentaion by Ms. Athira K, Asst Prof.